Ice fishing is the activity of catching fish with lines and fish hooks or spears through an opening in the ice on a frozen body of water. Ice anglers may sit on the stool in the open on a frozen lake, or in a heated cabin on the ice, some with bunks and amenities. 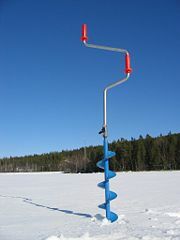 Ice fishing is popular in almost all regions that have ice in some or all seasons such as Iceland, Finland, Norway, Sweden, Russia, Canada, the United States, and others. Contrary to some non-anglers beliefs, ice fishing can be just as exciting as any other sport or type of fishing. Unlike boat fishing, anglers are free from getting sea sick. Despite the freezing conditions, ice fishing can be a fun activity for people of all ages provided that proper safety precautions are followed. Ice fishing, as well as other outdoor sports, requires participants to be conscientious and aware of their effect on the environment. It is a popular pastime in Canada, Finland, Estonia, Latvia, Norway, Sweden, Russia, and Germany. In the United States, people from Alaska, Colorado, Minnesota,Wisconsin, Michigan, New York, the states of New England, and other areas with lakes and long, cold winters enjoy the activity. One of North America's largest ice fishing contests is held in Forest Lake, Minnesota. Longer fishing expeditions can be mounted with simple structures. Larger, heated structures can make multi-day fishing trips possible, but these are eschewed by many seasoned fishers, who fish with no protective structure, attired only in heavy winter wear. A structure with various local names, but often called an ice shanty, ice shack, fish house, shack, bobhouse, or ice hut, is sometimes used. These are dragged or trailered onto the lake using a vehicle such as a snowmobile, ATV, or truck. The two most commonly used types are portable and permanent. The portable houses are often made of a heavy material that is usually water tight. The two most common types of portable houses are when your shelter flips behind the user when not needed, or a pop up shelter so the only means out is through a door. The permanent shelters are made of wood or metal and usually have wheels for easy transport. They can be as basic as a bunk heater and holes or having satellite TV, bathrooms, stoves, full size beds and may appear to be more like a mobile home than a fishing house. 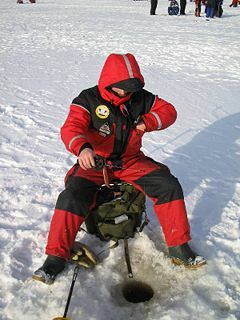 In North America, ice fishing is often a social activity. Sometimes, the consumption of alcohol is involved. Some resorts have fish houses that are rented out by the day, often, shuttle service via Snow Track or other vehicles modified to drive on ice is provided. In Finland, solitary and contemplative isolation is often the object of the pastime. Fishhouses are a rare occurrence, but wearing a sealed and insulated drysuit designed of space-age fabric is not. In North America, Houses appear to create a city at locations where fishing is best. The Vista Shanty, an unusual shanty with a view. 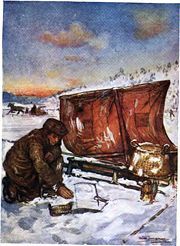 An ice shanty (also called a fishing shanty, fish house, bobhouse, or ice hut) is a portable shed placed on a frozen lake to provide shelter during ice fishing. They can be as small and cheap as a plastic tarp draped over a frame of two-by-fours, or as expensive as a small cabin with heat, bunks, electricity, and cooking facilities. More durable ice houses are generally left on a lake for the duration of the winter. Lighter, cheaper versions can collapse into a package to be moved from lake to lake during the season. Many northern communities have developed bodies of laws about the operation of ice shanties—frequently including dates by which they must be removed, even if the ice can still hold them. In northern climates, ice shanties are the center of a large, often humorous, folklore. Fishermen often decorate their ice shanties in humorous ways, while others studiously work on ways to make their ice shanties more comfortable and efficient. Much of the folklore involves the inherent danger of erecting a structure atop a frozen pond. Ice fishing gear is highly specialized. First, an ice saw or auger or chisel is required to cut a circular hole or larger rectangular hole in the ice. Power augers are sometimes used. A skimmer is used to remove new ice as it forms and to clear slush left from making the hole. During colder periods most ice anglers choose to carry a heater of some type. The heater is for warmth and it also keeps an anglers fishing hole from freezing. When temperatures reach -20 °F or colder it becomes very hard to keep a fishing hole open. Three main types of fishing occur. Small, light fishing rod with small, brightly colored lures or jigs with bait such as waxworms, fat heads or crappie minnows. Tip-ups, which carry a line attached to a flag that "tips up" when a strike occurs, allow unattended or less-intensive fishing. The line is dragged in by hand with no reel. In spear fishing, a large hole is cut in the ice and fish decoys may be deployed. The fisherman sits in a dark ice shanty called a dark house. The fisher then peers into the water while holding a large spear attached to a line waiting for fish to appear. This method is often used for lake sturgeon fishing. In the United States, many states allow only rough fish, such as northern pike, to be taken while spear fishing. Becoming increasingly popular is the use of a flasher, similar to its summer cousin the fish finder. This is a sonar system that provides depth information, as well as indicates the presence of fish or other objects. Underwater cameras are also now available which allow the user to view the fish and observe their reaction to the lure presentation. Many fishers will go out with 2.5 inches of good ice for walking, but the recommended depth is 4 inches, 5-6 inches for sleds (Snow Machines, Snowmobiles), 7-12 for light cars, and 14-16 inches for full sized trucks. Care must be taken, because sometimes ice will not form in areas with swift currents, leaving open areas which freezes with much thinner ice. On the Great Lakes, off-shore winds can break off miles-wide pans of ice stranding large numbers of fishermen. Late-winter warm spells can destroy the texture of the ice, which, while still of the required thickness, will not adequately support weight. It is called "rotten ice" or soft ice and is extremely dangerous. Some ice-fishermen will continue to fish, since even with the bad ice normally 8 inches is more than enough. Fishers may carry a self-rescue device made of two spiked handles connected by a string to pull themselves out of the water and onto the ice. Many cars, trucks, SUVs, snowmobiles, and fish houses fall through the ice each year. Current environmental regulations require the speedy recovery of the vehicle or structure in this situation. Divers must be hired, and when the trouble occurs far from shore, helicopters may be used for hoisting. Other risks associated with ice fishing include carbon monoxide poisoning from fish house heaters and frostbite due to prolonged exposure to wind and low temperatures, although most new houses are fitted with air exchange systems that allow air flow preventing poisoning. Ice fishing contests offer prizes for the largest (by length or weight or combined) fish caught within a limited time period. In Michigan, "Tip-Up Town, USA" can bring 40,000 people out onto Houghton Lake for festivities which include ice fishing, snowmobiling, snow sculpting, and fireworks. In Minnesota, the "Forest Lake VFW Fishapalooza" boasts one of the largest ice fishing contest payouts at $175,000. ↑ Wisconsin Stories, Native-American Ice Fishing. Retrieved September 18, 2008. ↑ New Hampshire Fish and Game, Remove Bobhouses Today. Retrieved September 18, 2008. Ice Fishing TV, Homepage. Retrieved September 18, 2008. Wisconsin Stories. Native-American Ice Fishing. Retrieved September 18, 2008. This page was last modified on 30 March 2014, at 22:55.